Gláis-éidigh ~ Meaning "green garment or cloak"
Glashedy Island, approximately one mile off Pollan Strand, Ballylifin on the peninsula of Inishowen is a small uninhabited island. 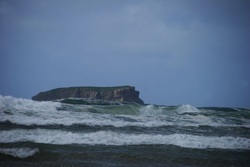 It was formally called Seale Island, it’s name being changed to Glashedy in the early 19th century. Although is mainly rock there is an expanse of green grass covering it’s top on this is where the name Glashedy comes from (glas being the Gaelic for green).